Multi-Target Applications (MTAs) are the result of a development process that at its end can build an archive containing multiple software or content pieces that is labeled by a unique version number. The purpose of MTAs is to enforce one common lifecycle for all these contained software pieces, although the runtime representation might be distributed. 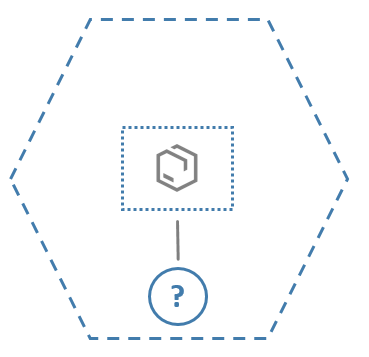 An often-heard question is how that fits to µServices, as leading architecture principle for cloud software. 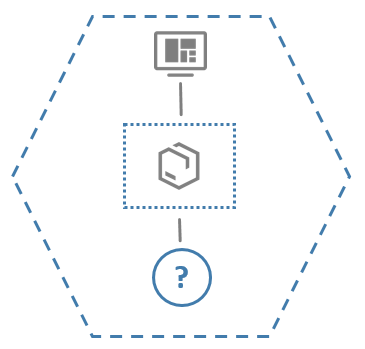 In this blog, I want to explain how both concepts, MTAs and (µ)services, come together. There are good reasons to couple the lifecycle of certain technical components, if they jointly represent a service offering a dedicated (business) capability. MTAs offer the option to leave it as a hidden implementation detail of how many runtime components such a service consists of. Now, one could think that MTAs could lead to monolithic applications, contradicting the µService approach. This is not the intent. To avoid this, the decision, which components shall have this coupled lifecycle, is critical. 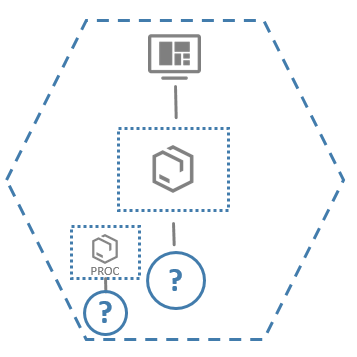 Also, µService architecture comprises a set of principles that have to be applied correctly also when working with MTAs. If this is considered, MTAs are not contradicting µServices, but both complement each other. When designing an MTA, you still have to do your componentization homework to avoid the monolith. However, MTAs enable you to choose the “size” of your µService according to your trade-off decisions related to “coarse-grained” vs. “fine-grained” services. Furthermore, MTAs help you to manage your dependencies to others, a task which gets more difficult the more µServices are around you. Let’ start with a brief recap of how Fowler motivated the case for µServices (see the blog Microservices – a definition of this new architectural term from James Lewis and Martin Fowler, available at https://martinfowler.com/articles/microservices.html – my last read-through was in January 2018). There are basically two promises: (1) improved scaling behavior and (2) componentization according to business capabilities and not according to technical capabilities and skills. So, if the team‘s responsibility is for a complete business capability, in general, their µService will still be composed of multiple technical components. If they want to attach one lifecycle (from dev to deploy) to these components, then the µService is an MTA! The database part is even harder to remove from your µService, if you want or need to deploy schema definitions or want to “push down” application logic to this database (as happening when pushing down code to SAP HANA). You could hold your business logic code module responsible for keeping the DB schema definition + DB code and for pushing it down to the database. 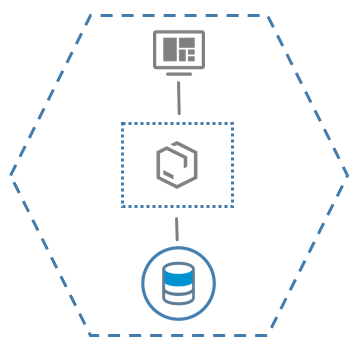 The MTA deploy service implementations for SAP HANA XS Advanced and the Cloud Foundry environment of SAP Cloud Platform helps you to orchestrate DB code deployment with other application code deployments. This could be further continued by saying you might want to manage the UI integration content (required to configure the UI integration service to display your UI appropriately) as a separate content module being part of your µService, or a documentation module that shall be part of your project and the deployed version of your docs should always match the version of your code. This is reasonable, if you want to provide a reusable, stateless service. In all other cases, this can happen only under very special assumptions on UI technology, on the role of the database and on DB content management. So, it can make sense to give your µService a structure. MTA concepts have been made to manage such structures from development to deployment. The reason is that you always have to watch and react on changes to the provided interface. Any new release from the interface provider might force you to deliver a new release of your code, because there is no contract available. This fact is often forgotten when praising µServices. Technically, you might be able to compose any stuff into nice small components, but do they all offer a (public) API? If not, you are left with the burden of managing all the implicit lifecycle couplings. What does this mean when looking at this small, agile, cross-functional team that wants to provide a business capability based on a µServices architecture, where this capability is technically represented by multiple runtime components (such UI, application logic, DB)? 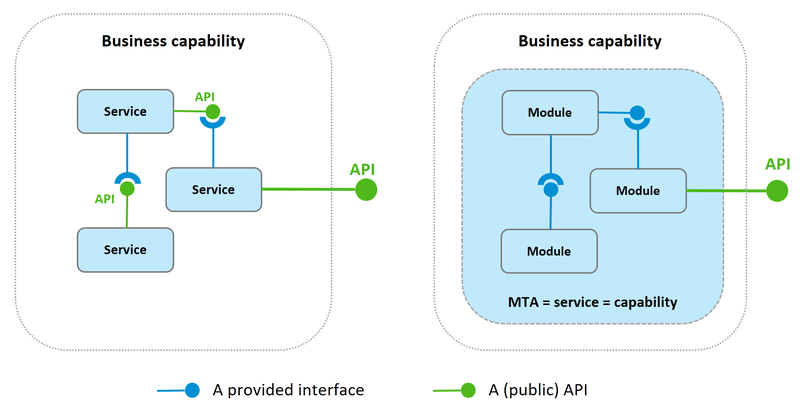 They have two choices: Either they introduce (public) APIs for these components (OPTION 1 in figure 7 below), or they accept and manage the coupled lifecycle (OPTION 2 in the below figure). 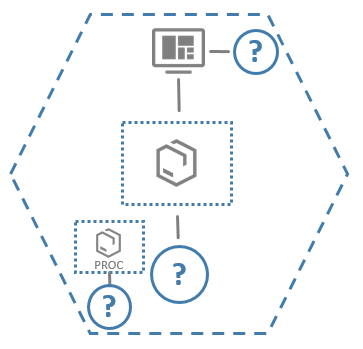 OPTION 1 enables to develop, release, deploy the components with independent lifecycles. At the same time, you have API-related effort to assure the required API qualities. The question then is: why should the team invest additional API-related efforts, if they need to deliver the entire business capability anyway always as a whole entity. It will not make sense to deliver “parts” of a business capability. If this would make sense, then the team did the wrong cut anyway, because this “part” is then a business capability of its own (go back to start …). Further, it’s a “small” (“pizza size”) team. They don’t need rigid contracts, because they can communicate and implement necessary changes quickly. In my opinion, it’s better to go for OPTION2 and accept the implications of coupled lifecycles. MTAs are a way to turn implicit lifecycle coupling into explicit lifecycle coupling. That’s the essence of MTAs. As the lifecycle is now an explicit one (captured by the MTA model), any tool that contributes to development, release, distribution, deployment, operations, monitoring processes can make use of this and help the team to establish the required common lifecycle for its components. There will be a cost for introducing the MTA. It’s probably not a big issue to author some additional metadata (descriptors). What is more costly is that an investment has to be made into development and deployment tools, so that they are able to interpret MTA metadata and perform the appropriate orchestrating actions. However, such investments have to be made only once and within a big software provider, a lot of teams can benefit from these. The idea of providing a business capability via a well-defined (public) API gets blurred, if there are multiple (public) APIs hanging around with the service. Although not available today, an MTA model can be the base for deployment and network infrastructures for exposing really only those endpoints, which are meant to provide the business capability while leaving others restricted to MTA-internal communication. Thanks for clarifying the concepts and explaining how micro services and MTA can complement each other.